Jean-Marc Souchon uploaded an image. Even though Velebit is at its narrowest in its southern section, this is also the area of its highest peaks. When viewed from the Zagreb-Split Motorway or from the peak of the hill of Zir, southern Velebit leaves a special impression, as it resembles an immense wall from that side. The littoral slope of the mountain is not as steep as the slope facing the region of Lika, and it also includes several pronounced terraces in high elevations, similarly as in the northern and central areas of Velebit. 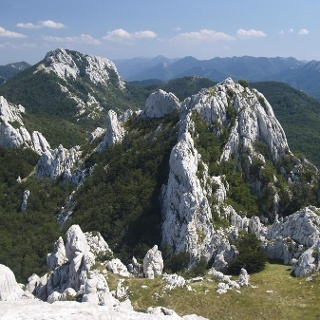 In the peak area of southern Velebit, we again come to two parallel and longitudinal series of peaks – one rising above Lika, and another above the sea. The first series of peaks is dominated by Visočica, Jelovac, Počiteljski vrh, Badanjski vrhovi and Badanj; the second series of peaks includes V. Pločeviti, Kozjak and Višerujna. These series of peaks together close trough-shaped karst valleys, large dolines and sinkholes, separated by barriers of various sizes. 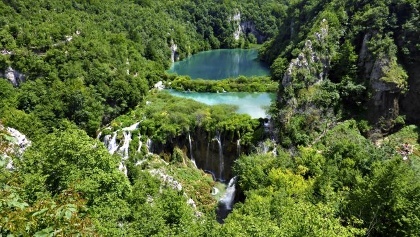 The largest such sites are Ramino korito and Šugarsko korito, followed by Šugarska duliba, Jančarica, Oglavinovac and Javornik. It is only at the southern end, in the section from Vaganski vrh to Sveto brdo, that the littoral and Lika series of peaks connect into a single ridge. In the southern area of Velebit, Via Dinarica again follows the route of the Velebit Hiking Trail, offering very good hiking opportunities. At Baške Oštarije, the first markings directing hikers towards Šugarska duliba are located on a building of the former school of Baške Oštarije, near the abandoned Velebno Hotel. The trail ascends to the ridge of Sladovačko brdo, and reaches the meadow of Sladovača. To the left, there is a branch leading to the peak of Veliki Sadikovac. From Sladovača, Velebit Hiking Trail markings steeply descend to the pass of Bukovo razvršje, proceeding along a long steep descent to Kljajina dolina and to a wide path from the direction of Konjsko. The Velebit Hiking Trail route continues further through the forest above Jurkova dolina to Markova paljevina, where the trail turns uphill to the left. In half an hour of hiking, we reach Piskovita kosica, where one needs to pay attention to an intersection. To the right, there is a trail leading to Lukovo Šugarje, and the trail to the left leads to Brušane. From Piskovita kosica, the trail continues straight downhill for 10 minutes to Šikića jatara. There, we come across a left branch through Ramino korito via Pasji klanac to Ripište. The Velebit Hiking Trail route takes us to the right, along the trail of Milkovića staza to Jurlino sedlo, where there is a trail to the right descending to the sea across Rudelić Rastovci (1 hour and 15 minutes). From Jurlino sedlo, the markings take us further along a mild descent to Jurlini vrtli, and then across the slopes of Jurlin kuk to dry stone walls of the karst valley of Zapeć, and to a well-built old tourist trail leading to Lukovo Šugarje. We take this trail and pass next to the cave of Milkovića peć, soon arriving to an intersection of hiking trails. 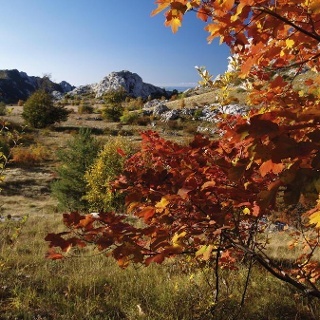 The tourist trail continues straight towards Lukovo Šugarje (3 hours), and the Velebit Hiking Trail turns left uphill above Bukova draga, and then through Jasenovački doci to the meadows of Ripište, where it connects with a hiking trail branch passing through Ramino korito. From this place, it takes approximately 20 minutes of hiking to the mountain shelter Šugarska duliba. In a wider area of Šugarska duliba, in a fairly limited locality, we come across one of four known habitats of the endemic species Velebit degenia. There is a marked trail leading from the mountain shelter at Šugarska duliba to the peak of Veliki Stolac, and the climb to the peak takes approximately 45 minutes. Sugarska Duliba is not there anymore. Good camping area near the well (not allowed though). Zdrilo is the best Skloniste ever, it has electricity, water (use the metal coin to make contact with the electricity thingies down the sink) and it is clean. I really enjoyed staying there. The trail between Sugarska Duliba and Zdrilo was overgrown at one part, where the GPS track goes of the Velebitski planinarski put. I went back to vpp.